The bride spotted varied looks by leading Indian and International courtiers for her different ceremonies. 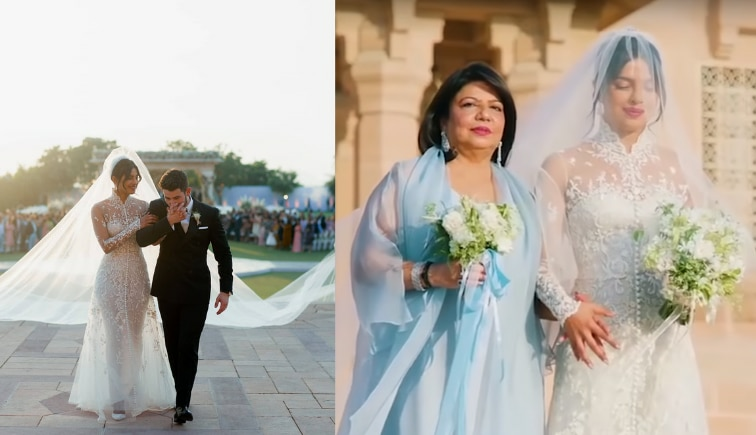 Priyanka Chopra and Nick Jonas tied the knot at Umaid Bhavan in Jodhpur. 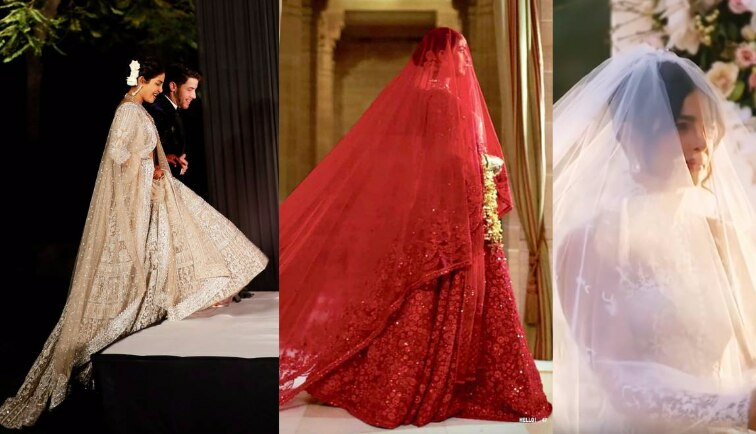 Here are all the looks Priyanka spotted at her different wedding festivities. 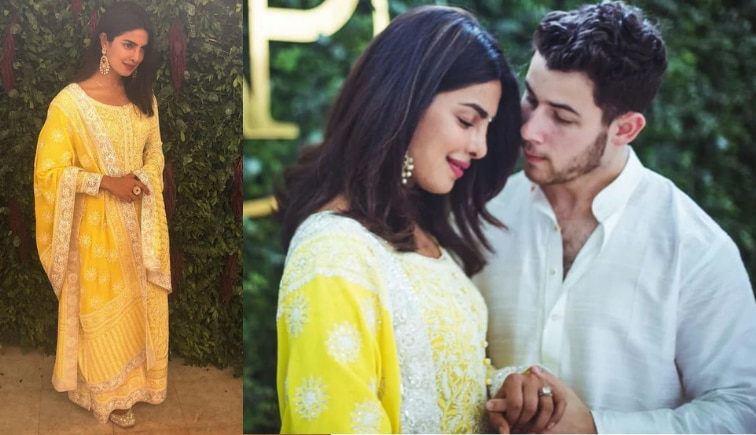 Engagement: For her engagement, Priyanka chose a yellow chikankari Anarkali by Abu Jani Sandeep Khosla. Pre Wedding Puja: For a puja held at Priyanka’s Mumbai residence, the bride-to-be chose a powder blue kurta set by Manish Malhotra. The kurta had intricate floral embroidery all over it. She chose to keep her jewellery minimal with only a pair of earrings by Mahesh Notandass. 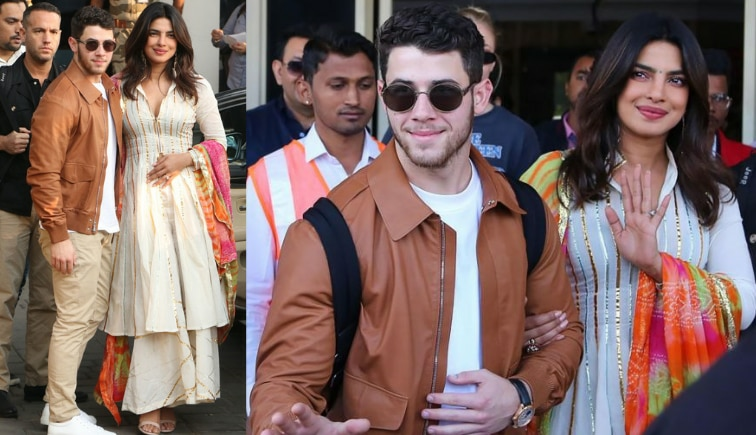 At the Airport: On her way to Jodhpur for her wedding, Priyanka spotted a white Abu Jani Sandeep Khosla narkali. The suit had gota embroidery and a colourful tie-dye dupatta. 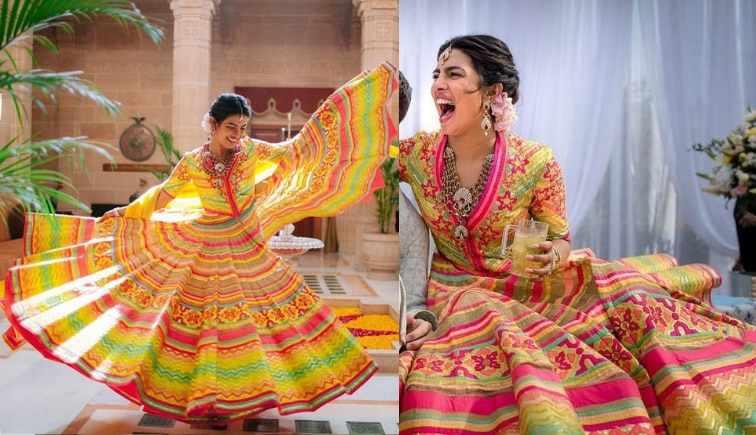 Mehendi: The wedding celebrations commenced with a Mehendi ceremony for which the bride chose a colourful Abu Jani Sandeep Khosla outfit. 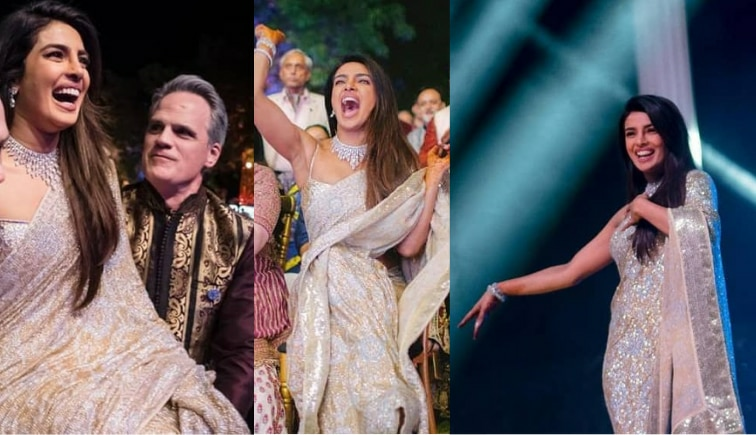 Sangeet: For her Sangeet party, Priyanka chose an embellished silver and gold sari by Abu Jani Sandeep Khosla. Chopra finished out her look with diamond necklace, earrings and a stack of bangles. 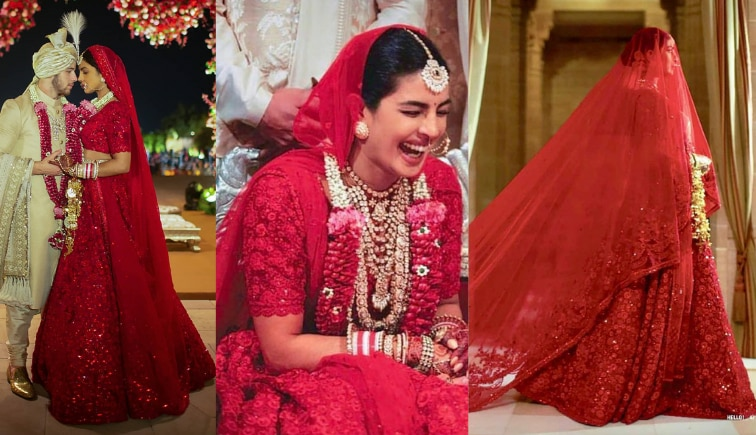 Hindu Wedding: For her Hindu wedding, Priyanka chose a red-custom Sabyasachi lehenga. The lehenga features hand-cut organza flowers, French knots in silk floss and layers of thread work. Traditional jewellery in uncut diamonds and emeralds by Sabyasachi finished out the bride’s look. Western Wedding: For her Western wedding, the bride wore a custom-made Ralph Lauren gown. The gown had floral and scroll motifs, scalloped sleeves and delicate tulle appliqués. The 75 foot train added drama to the whole look. 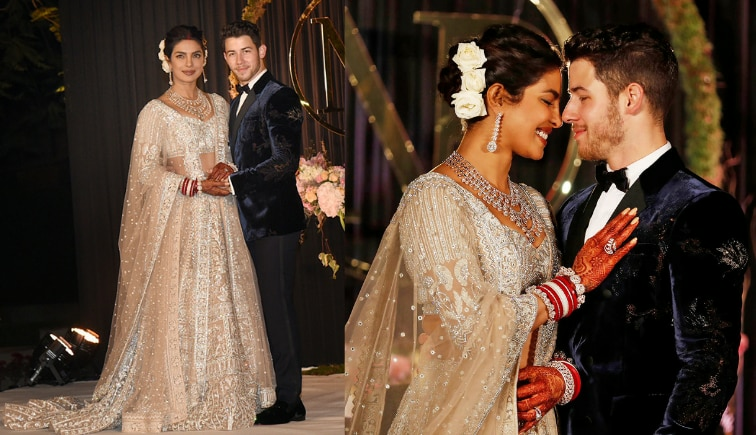 To give it a personal touch, Priyanka’s gown had her groom’s full name, her parents’ name and their wedding date sewn onto her gown. At the Airport: On their way back from Jodhpur, Priyanka wore a green sari by Sabyasachi. Apart from the traditional chuda and mangalsutra, a small necklace, and cat-eye sunglasses were the bride’s choice of accessories. Delhi Reception: For her Delhi reception, Priyanka chose a champagne-hued Falguni Shane Peacock lehenga. Diamond jewellery by Mahesh Notandass finished out the look.